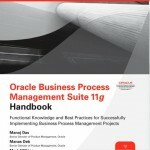 Recently McGraw Hill published the Oracle Business Process Management Suite 11g Handbook. It is available on their site and at Amazon.com. 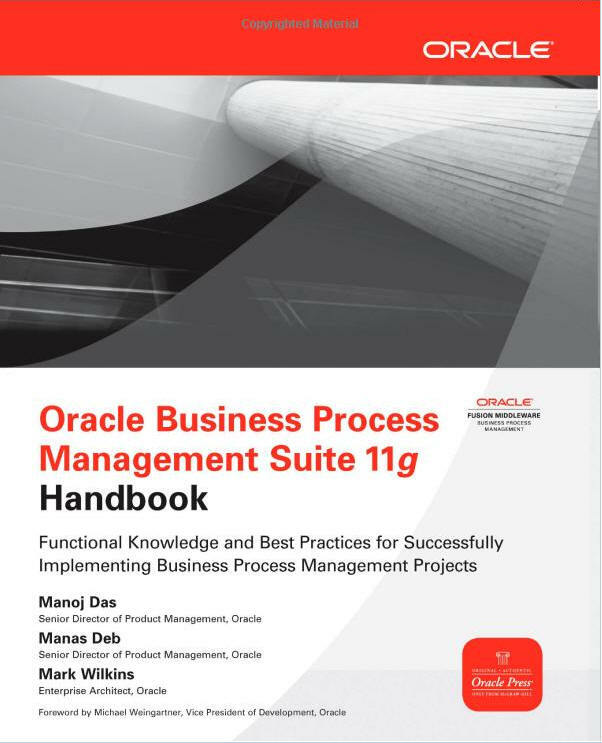 This entry was posted in Oracle, Release, SOA Suite, Tools and tagged 11g, ADF, book, BPM, Fusion Middleware, Release on 2011/10/27 by PeterPaul. During the Kscope Thursday Thunder a team of highly skilled ADF (including JHeadstart) and SOA Suite experts is building an application based on these technologies. Although this session – like any real world project – seemed chaotic at times, there were a lot of best practices to learn for all who attended. We could have learned all of the tips and tricks in a normal session or presentation. However by working this way there is a much stronger feel of how technologies and tools are used in a real world project. It was fun to watch and learn and I think the team had a great time as well! At the en of the session the End-to-End flow worked really well. Great work in just a few hours time! This entry was posted in JDeveloper, Oracle, SOA Suite and tagged ADF, BPEL, JDeveloper, kscope, SOA Suite on 2011/06/30 by PeterPaul. There are a lot of presentations at Kscope on ADF where it is mentioned that the level of Java knowledge to implement ADF based applications is very limited. The first presentation by Markus Eisele I saw on Monday was an introduction to Java. It was called “All the Java ADF beginners need to know”. In this hour a short history, Java’s characteristics, at a high level the differences between Java EE, Java SE and Java ME were covered as weel as the the basics of the Java language. EuroTransplant is one of the SOA Suite customers that uses the Business Rules Engine that comes with it in a production environment. Wilfred van der Deijl showed us from a developers perspective how the tools is used. During the presentation was clear that business goals like “the business must be able to verify the implemented rules” were clearly met. Edwin Biemond gave “An Introduction to Application Integration Architecture“. The demo in his presentation helped to demystify the implementation of an AIA integration flow. This entry was posted in AIA, JDeveloper, Oracle, SOA Suite and tagged ADF, AIA, kscope, SOA Suite on 2011/06/29 by PeterPaul. Some notes and dump of thoughts on the second day of the SOA and E20 Partner Community Forum. A day filled with interesting breakout sessions. Some of them were discussing roadmaps and future developments in the stack, and thus subjective to an NDA. Again after this session I came to the conclusion that in my opinion BAM is used too little. During the session was raised whether people in the audience were using non-Oracle databases as dehydration store and Meta Data Store. The mainstream is using Oracle as dehydration store. And although it is certified, it is advised to use Oracle as the database for this purpose. On the Application Server, given the maturity of the J2EE platform, there is less discomfort in operations to deploy the SOA Suite on a non-Oracle App Server. Only today I found out that there is an interesting JDeveloper 11g extension. The extension validates ADF code quality. Seems an interesting extension to check code quality besides the already available Java tools. When comparing BPEL and BPM and looking into when to use what tool, the following was stated: For all things with human interaction BPM is the tool of choice. In integration driven appraoches BPEL is the tool of choice. without the need for separate platforms. Example of a custom Spring Java worklist application for Oracle BPM. This entry was posted in BPEL, JDeveloper, Oracle, SOA Suite, WLS and tagged 11g, ADF, BPM, Fusion Middleware, JDeveloper, Oracle, SOA Suite, WLS on 2011/03/16 by PeterPaul. Integration of ADF Faces with JavaServer Faces 2.0 is an exciting process that has just begun with the release of Oracle JDeveloper 11g R2 and will continue to be significantly enhanced with the subsequent releases. The aim of ADF Faces is to continue to provide the unparalleled level of functionality and productivity to developers while moving to JSF 2.0. From an ADF Faces framework perspective, most of the changes in adopting JSF 2.0 are internal and should be transparent to developers. JDeveloper FAQ Index – Frequently Asked (and not so frequently answered) Questions related to the JDeveloper development environment. With very usefull links to ADF resources and on installing and configuring your development environment. The Google Group that goes with the The Oracle SOA Suite 11g Handbook by Oracle ACE Director Lucas Jellema. A JPA tip on @PrivateOwned from the Whitehorses blog. Technical Debt explained by Andrej Koelewijn. This entry was posted in JDeveloper, Oracle, SOA Suite and tagged 11g, ADF, JDeveloper, JSF, Oracle, SOA Suite on 2010/11/30 by PeterPaul. You can download a free PDF on Designing the Service Contract (alternative link). This is a sample chapter from the book Oracle SOA Suite Developer’s Guide. The book is available form here. There is a free sample chapter on how to create Portlets using ADF available (alternative link). The chapter is taken from Web 2.0 solutions with Oracle WebCenter 11g. The book is available here. This entry was posted in JDeveloper, Oracle, Release, Service Orientation, SOA Suite, WLS and tagged 11g, ADF, Contract, Fusion Middleware, Java, JSF, Oracle, Portlet, SOA Suite, WebCenter, WLS on 2010/10/15 by PeterPaul.